Boulder City High School basketball standouts Derrick Thomas and Ellie Howard were named Nevada all-state honorable mention selections. (Robert Vendettoli/Boulder City Review) Boulder City High School senior Derrick Thomas, seen slashing his way to the basket against Mojave on Feb. 23, has been recognized as an all-state honorable mention for his performance on the Eagles' basketball team and helping lead the way to their first league championship since 2012. 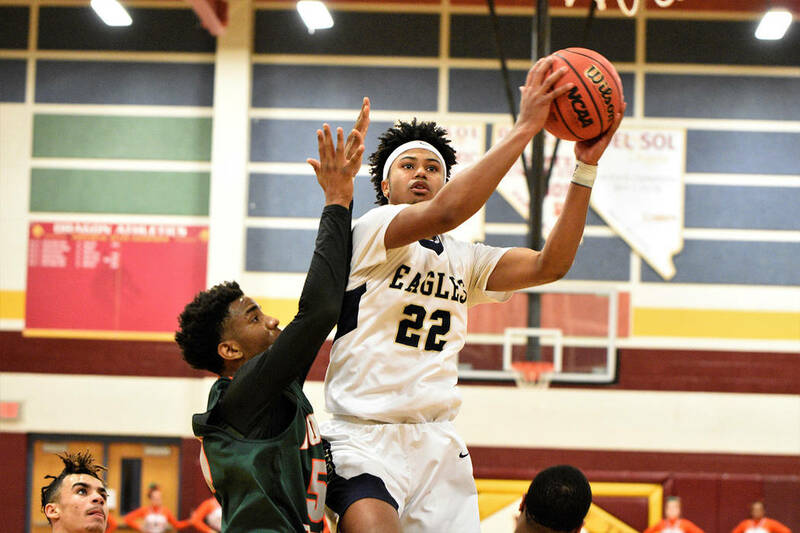 Having a breakout season with the Eagles, Thomas a 6-foot-5 forward was named 3A Sunrise League player of the year after leading the boys to their first league championship since 2012. A combo wing with great scoring touch, Thomas was the second leading scorer in the 3A classification, averaging 18.2 points per game. Thomas, who is weighing his collegiate options, also contributed with 6.4 rebounds and 2.5 assists, while swiping two steals per game on the defensive end. Howard is hopeful her breakout junior campaign and all-state nod can open a few doors though she has another year before she needs to make her collegiate decision. Named 3A Sunrise League player of the year for helping the girls team reach the state tournament for the first time since 2014, Howard said she was honored by the nomination. Dominant inside the paint and on the boards for the Lady Eagles, Howard averaged 17.5 points and 12.5 rebounds per game, while adding 1.5 blocked shots on the defensive end. A jack-of-all-trades for Boulder City High School’s flag football team, senior Ryann Reese was named an all-state honorable mention selection. Playing all over the field for the Lady Eagles, Reese scored a touchdown rushing, receiving and on defense, establishing herself as a true playmaker. One of the top players in the 3A classification, Reese rushed for 1,299 yards and 10 touchdowns, while catching 70 passes for 567 yards and seven touchdowns. A two-way player, Reese generated 57 tackles on defense with five interceptions and two defensive touchdowns.